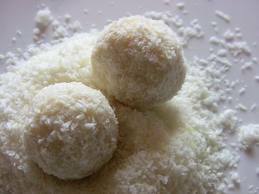 Coconut & Vanilla Balls – A great recipe from Arabic Bites. I will make them at Eid time :) with variations. Serve with arabic coffee or tea. In a mixing bowl, cut the butter into pieces and let sit at room temperature.Chop the shredded Coconut into a coarse meal and set aside.When the butter is softened, beat in 3 tablespoons of granulated sugar with an electric mixer and cream together well. Add the vanilla extract to the creamed mixture and blend in completely. Then, stir in the Coconut until evenly blended. two with hands until all the flour is blended into the dough. on a ungreased cookie sheet. Bake for about 15 minutes, until bottom is golden(Oven Temperature 325°F). Remove tray from the oven and let cookies sit on tray for a few minutes. toss and turn in the sugar until coated. 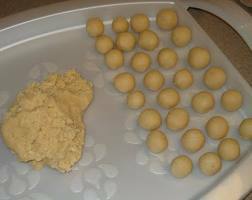 Place on a large tray to continue cooling for 5-10mins, then return to the bowl with the sugar and coat again. Set on tray to cool completely. cool for a beautiful white coating. 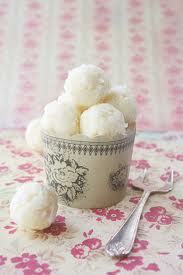 *To make Almond Balls use blanched almonds and almond extract instead of Coconut & Vanilla. 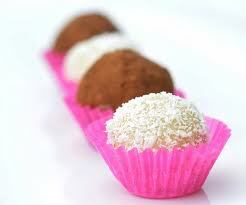 *You can add any fruit inside the filling in the centre and roll the balls as well. *You can add cocoa powder to the flour mixture and make varities in brown and white as well.